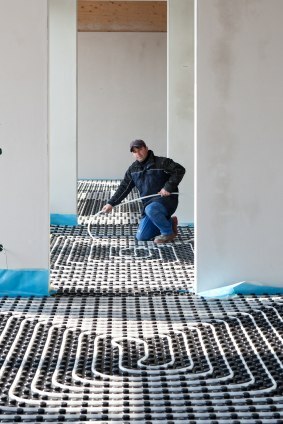 Trained Professionals – Radiant heating provides affordable, eco friendly heat for buildings of any size, and Barone's Heat & Air, LLC has the experience to make this heating system work for you. Having been in business since 2009, our trained and qualified contractors know the intricate details of this complicated system. We, at Barone's Heat & Air, LLC, provide product details, design advice and professional installation, backed by reasonable prices and top-notch service at every stage of your project. Custom Designed Systems –Radiant heating systems must be well designed to maintain peak efficiency and affordable heating costs. Barone's Heat & Air, LLC has been in the heating business since 2009, providing custom designed radiant heating to homeowners and businesses around the region. We look at the specifications of each project, take into account your unique needs and put together a system that will perform reliably for years. Solid Warranty – Trust in Barone's Heat & Air, LLC to take care of your radiant heating project. Our products and service come with our warranty and dedication to customer satisfaction, ensuring your project is handled professionally from start to finish and beyond. Let Barone's Heat & Air, LLC help you choose the system that’s right for your needs, hire our professional contractors to install that system and rest easy knowing that our solid warranty will protect your family’s comfort levels for years to come. Barone's Heat & Air, LLC provides the trained installers and custom designed systems your home or business requires. Our quality products and inclusive warranty can create the affordable, reliable radiant heating system you’re looking for. Call (417) 232-0017 today for more details and pricing.